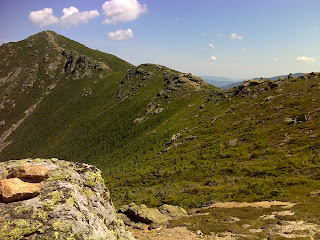 Today was a big day - the beginning of a multi-day traverse through 27.7 miles of rugged high peaks with no road access. You might remember my reports from down in Great Smoky Mountain National Park where I did 30 mile days to hike through two similarly long sections from either end to the middle. But Smoky Mtn. Park has a policy that no trail in the park can be steeper than 15% grade. In the White Mountains of New Hampshire there's no such policy, and so no hope for me to cover this 27.7 miles in two long days from either end. On the other hand, in the Smokies the access trails are too long to usefully insert a day hiker into the middle, whereas here in the Whites there is an abundance of access trails of four miles or less in length. So that's the plan - bite off two chunks at either end and then do the rest via side trails. Today I took the bite from the south end - from Franconia Notch. And what a bite it was! It contains nearly all of the 2.5 miles of trail above timberline that this 27.7 mile section has to offer. I love tundra and the sense of vastness that it gives. To borrow Montana's motto: it's 'Big Sky Country', and being a weather-nut I love to be in touch with the sky - the more the better. The day started with a climb of about 3000 feet up Liberty Spring Trail. I was worried about this climb. Based on the elevation profile it looked like it could contain some super-difficult scrambling, use of hands, etc. I expected that. I was hiking by the clock today, meaning that I would hike as far as time allowed and turn around when half the day's hiking time was over - get as far as I could into the tundra and then pick up the rest tomorrow from a side trail. Well, the Liberty Springs trail turned out to be much easier than those expectations. Yes, it was steep - consistently and reliably steep. Yes, it was rocky. But there was no need to use hands to pull yourself up, no steep bedrock with only sketchy footholds to get you up - just rock scrambling over medium to small rocks. 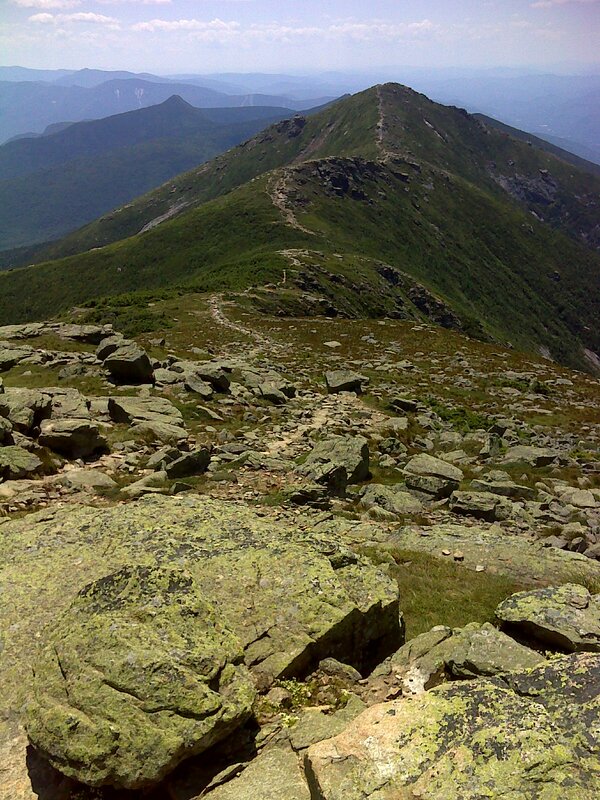 When the trail reached the spine of Franconia Ridge it actually got easier. It was almost level in places and never difficult. Bottom line: I got to cross two major summits and reach the prize - Mt. Lafayette. 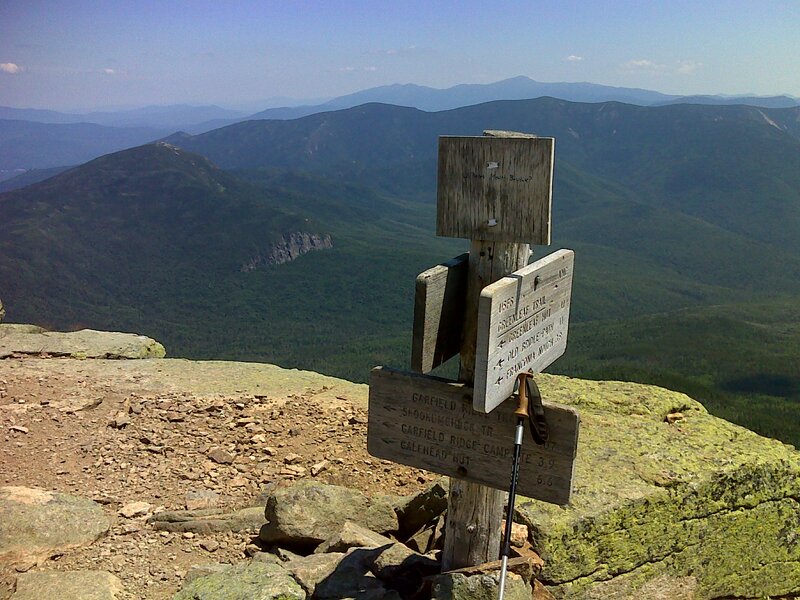 At 5260 feet, it's the highest point of the 27.7 miles. The two other summits were Little Haystack (4800') and Mt. Lincoln (5089'). 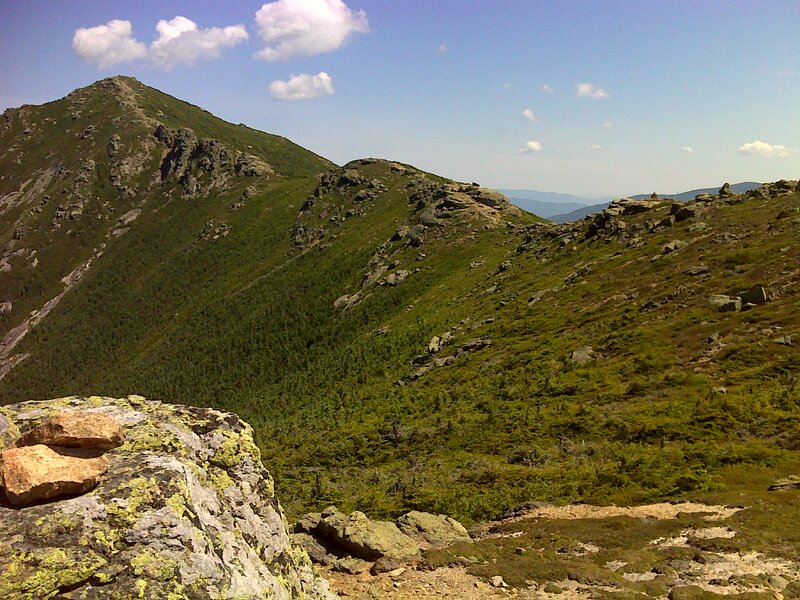 The picture up top shows the traverse between those other two, taken from Little Haystack. Below is the view from the summit of Mt. Lafayette showing the transit across from Mt. Lincoln. The pointy mountain beyond is Liberty Mountain. Little Haystack is barely peeking out from behind Mt. Lincoln. And as I've said many times before in these reports, one of the joys of my style of hiking the trail is that I get to come back to this same spot tomorrow and enjoy it again. Stay tuned. Here's a map of today's walking. The title provides a link to all the photos marked by red pins on the map, as well as an elevation profile.